The Japanese Peace Pagoda is located in the majestic city of Galle, Sri Lanka and is the most peaceful attractions of the city. This place is a heaven for people seeking inner peace and calmness since the tranquil atmosphere of the place is soothing for the soul. This beautiful, round shrine located in Sri Lanka serves as a symbol of peace and is sometimes stated as resembling a giant marshmallow when viewed from a distance. 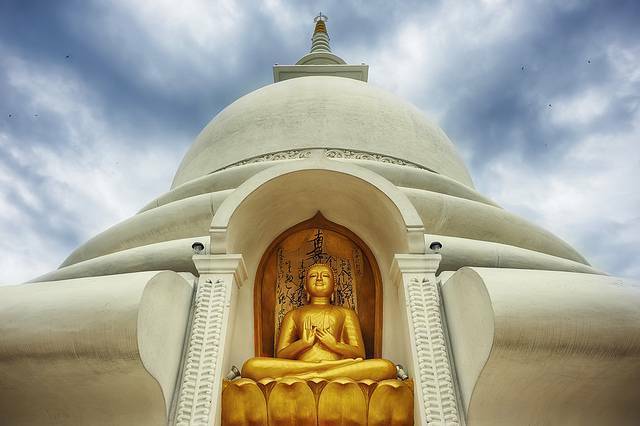 Situated on top of Rumasalla Hills, it is one of the three stupas in Sri Lanka which have been built by Japanese monks. Stupas are basically monuments that are designed to inspire peace among people belonging to different nationalities and creeds and the Japanese Peace pagoda tops this list. You can take a walk around this place and spot the white, towering bell-like structure which is surrounded by statues in gold paint. The most attractive part of this place is the walkway which encircles the shrine and provides a 360 degree view of the jungles and the shrine. The Pagoda can also be spotted from the main Unawatuna Beach which is quite impressive. This place looks ethereal during the sunset with a great view of the open space between Galle and Unawatuna. The Japanese Peace Pagoda is worth a visit for this spectacular view and to experience the serenity of this place.